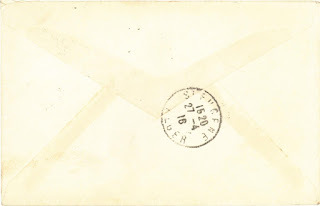 I have put these four envelopes together because they're very similar. They all measure 5 9/16" x 3 5/8". 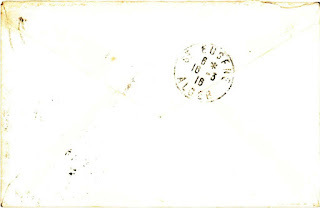 They are all a yellowish off-white, possibly white originally. 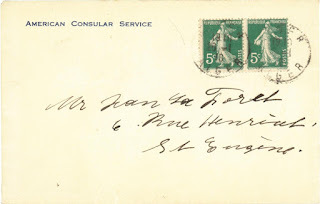 They all have "American Consular Service" printed in the upper left, in the return address area. 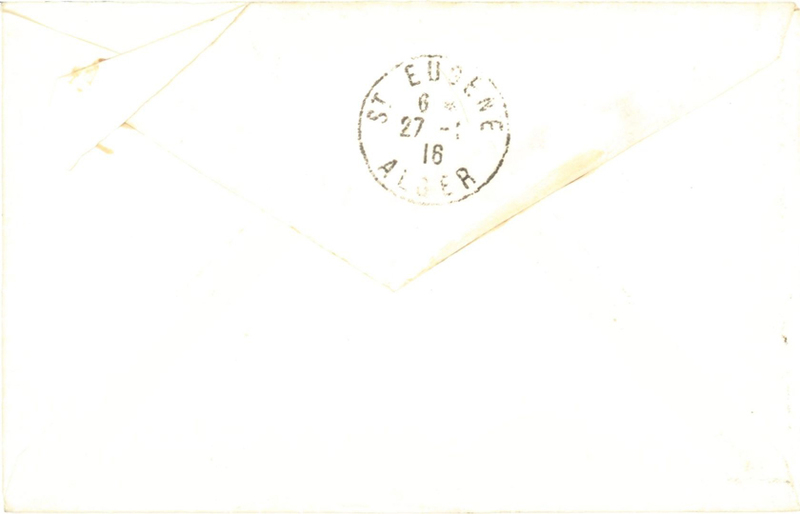 They're all hand addressed to Jean La Forêt — one to "Mr. Jean La Foret", two to "Mr. Jean La Forêt", and one to "M. J. 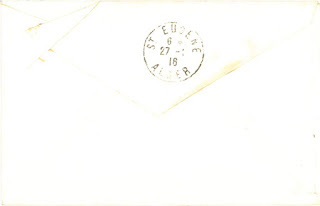 La Forêt." They all were postmarked Algiers and were sent to Jean at 6 rue Henricet (the address on Jean's business card), St Eugène (which we already know was a neighborhood within Algiers), at a cost of 10 centimes each. 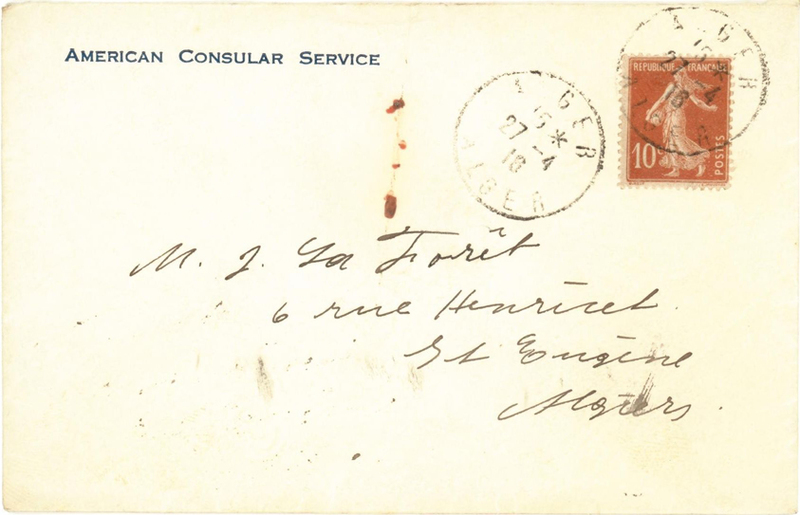 The first envelope was mailed January 26, 1916 in Algiers and arrived in St. Eugène on January 27. 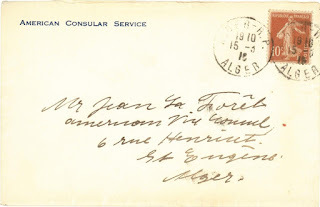 The second was mailed March 15, 1916 and postmarked "Alger R. P."; it arrived in St. Eugène on March 16. The third was mailed April 3, 1916 in Algiers and arrived in St. Eugène the same day. 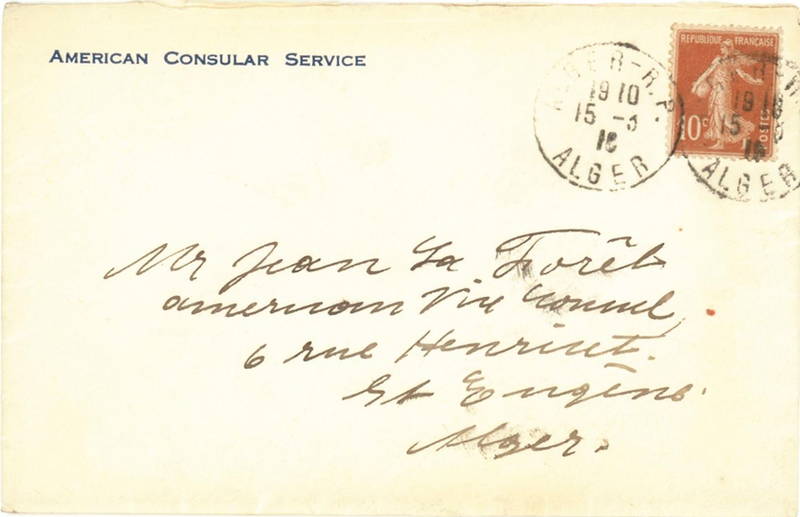 The fourth and final envelope was mailed April 27, 1916 in Algiers and arrived in St. Eugène the same day. 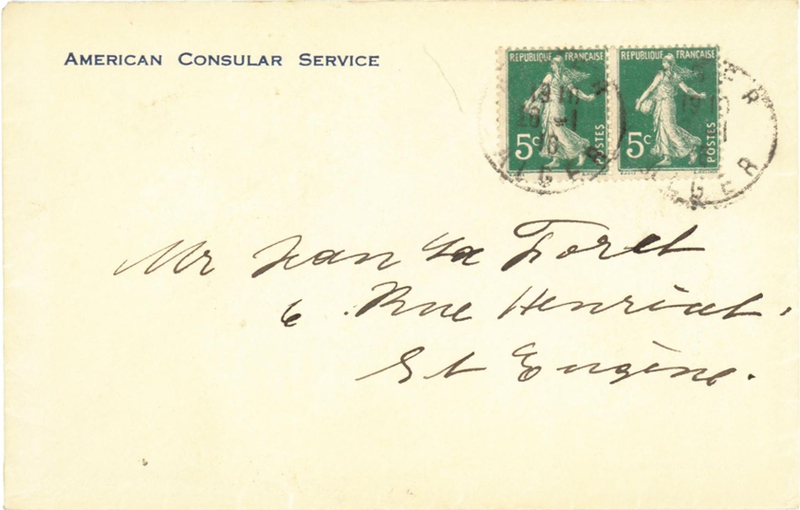 The "R. P." designation on a postmark appears to exist even today, but I can't figure out what it stands for. My guess is that it was a name for a neighborhood. 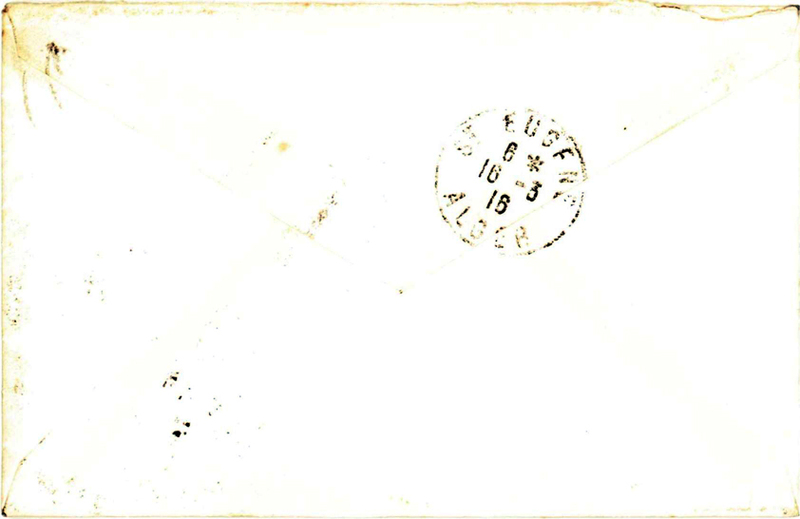 The handwriting looks similar on all four envelopes, so I think it's a reasonable hypothesis that they were all sent by the same person. 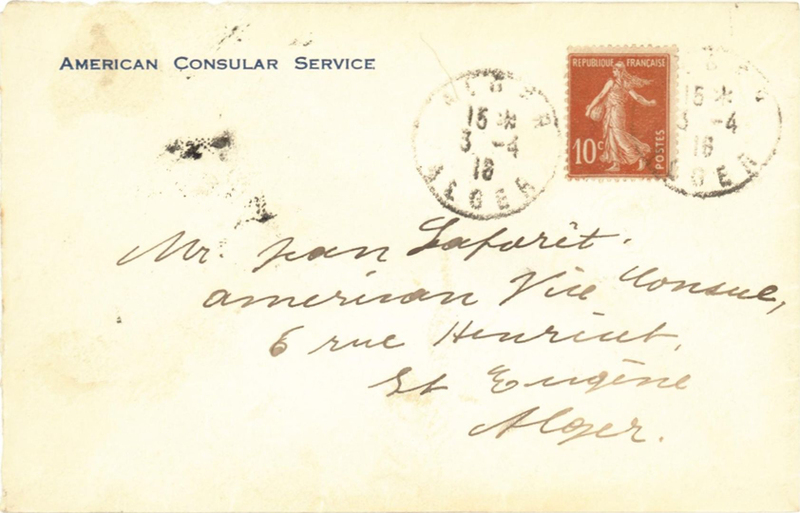 So someone who was living or working in a different part of Algiers than St. Eugène, and who apparently worked for the American Consular Service, mailed four letters to Jean during the first few months of 1916. It's possible they were all work-related. 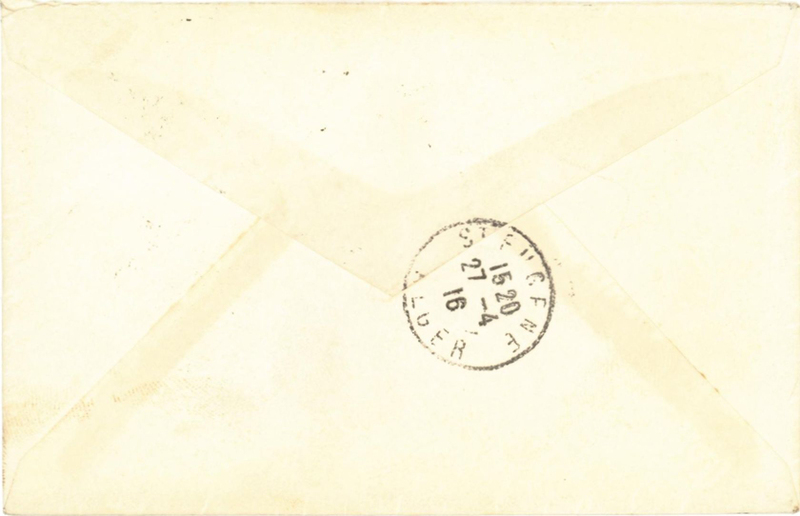 If they were for work, the letters may have been filed. But then why would he keep the envelopes? 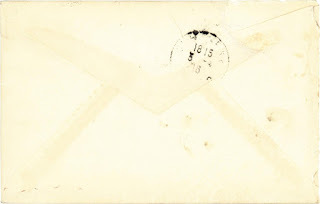 And if the correspondence was personal, why did it disappear over the years but the envelopes remained? I wish I knew the complete chain of who had all this material before it reached me!